A tornado has struck my studio. At least that’s what it looks like. Sorting through all my stuff at home in preparation for a move has meant boxes of random flotsam and odd souvenirs from my past lives landing willy nilly in Studio Land. Disrupting the normal levels of chaos to EXTREME levels of eclectic white noise. Which is what it sounds like in my brain right now. Unfortunately, as I am planning to open my studio for this Friday’s Gallery Night (and Bay View Gallery Night, June 1st) the “Great Sort-Through of 2012” must continue. Epic sorting and boxing and tucking into corners must commence!!! I’ll have a whole table or area designated for art rummage and have them marked as such. I’m thinking orange dot stickers? And, of course, many original works from “The Circus and the Cyclone” will be up on the walls along with prints and copies of the book. The circus must continue! I guarantee you will find ample amounts of visual stimuli. And probably be mildly confused by the time you leave. Old things, new things, new prices and strange encounters. All happening at The Hide House, suite 9F. Friday, April 20th 6-10pm. Please take something home with you. Now that my own book is finished and copies are heading off to their various destinations, I finally have time to read again! (It’s been a while.) My “must read” list has been growing steadily over the past year and I’ve only managed to make it through a handful of titles. Many of them are circus themed books that people have been recommending, which I am always grateful for! I recently finished Erin Morgenstern’s The Night Circus, and was entirely spellbound from start to finish. I’m now midway through Game of Thrones and plan on reading Natania Baron’s Pilgrim of the Sky after that. So, enough of the chit-chat. I have a confession to make. I have never read a single Harry Potter or Twilight book. Shocking, I know. For someone who loves fantasy, horror, and dark romantic drama as much as I do, it seems kind of strange that I haven’t gotten around to either of these series and I had to actually stop and think about why that is. In truth, part of me always wanted to. Unfortunately, these books first started appearing right at the time I started college when I found myself constantly overloaded with assigned reading. Also, as a newly self-proclaimed adult, the books looked a little too kiddish for me. Between the cute, whimsical cover illustrations and character names like “Dumbledore” it didn’t exactly seem like something I wanted to be investing my grown-up time on, so I took a pass. I watched as friends and family members a few years younger than me devoured the Potter universe and got hopelessly hooked. I felt the urge to join in, but kept telling myself, “I’ll get around to reading this someday. When I don’t have so much going on.” I decided to skip out on the movies as well, thinking it would be better to read the books first. 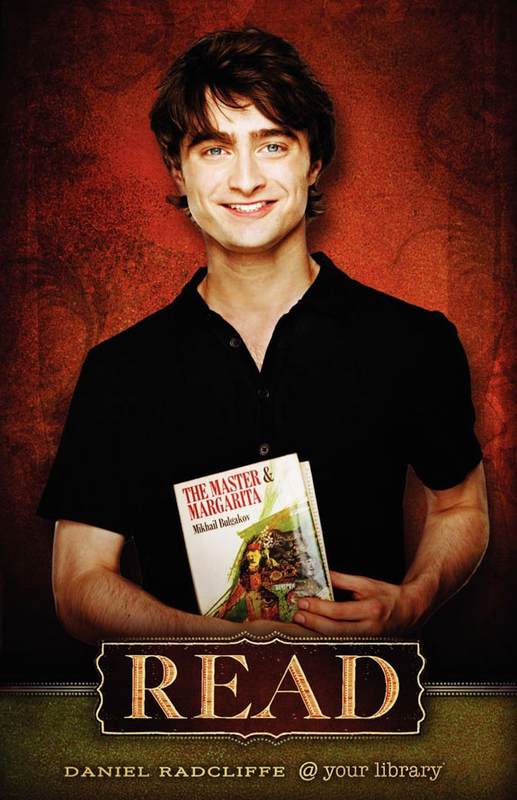 Years later, all of my Potter-crazed friends were raving about how great the most recent movie was. It was the third movie. So my husband and I rented the first two, then went to The Prisoner of Azkaban in theaters. We got invited along to each of the following movies as they came out. Now knowing the story, I feel like reading the books might be a little after the fact. Plus, with all the hype, I feel burned out on the Potter world. Even when I do decide to finally read them, (and I probably will) I fear I won’t really get to enjoy them as literature, having already experienced Harry Potter as a piece of pop-cuture mass-hysteria. Truth be told, I now regret not reading them earlier, before the movies each came out. Thankfully I started reading Tolkien in middle school when it was still nerdcore. Huzzah! This is where I have a problem. I try to remember my own 14-year-old girlhood and I don’t recall having read a single piece of literature aimed at that age group. When I was 14, I was reading piles of Arthur C. Clarke and Stephen King books. I also read Tolkien and Michael Crichton. Then there was my non-fiction pleasure reading, mostly on the subjects of geology, paleontology, and art history. The summer of my 14th year, I went on a 2-week fossil dig in Nebraska where I camped with other girl nerds and geeked out when I uncovered the leg bone of a three-toed horse. Evolution! Cool! In short, I can’t get into the mindset of a 14-year-old girl because I don’t think I ever truly was one – at least not the kind that 14-year-old girl stuff is marketed toward. So, between my lukewarm feelings for vampire fiction and my inability to channel the desires of a (more typical) middle school girl, I probably won’t ever bother with Twilight. I don’t negatively judge those who enjoy it (they probably are more normal than me), it’s just not my thing. When we got to the “truffle shuffle” scene, I didn’t laugh. I just sat there dumbfounded. It was a fat joke. A really stupid fat joke. After all those years of hearing about it like it was this amazing inside joke I wasn’t in on, to see the scene played out was beyond anti-climatic. In fact the whole film was… not at all what I thought it would be. Who knows. Perhaps one day I will proudly embrace my identity as “That Woman Who’s Never Read Twilight.” Or “She Who Has Not Read Harry Potter.” But for the time being, they wait at the very end of a very long list of “must read” books. Call them my “might read” books. The story is told, the whole thing is off to the printers, and I have a mountain of framing to tackle! The books and prints will be sent out to my Kickstarter backers and also will be available online. But so far, only eighteen of the the original illustrations have found their way into my vintage frame constructions. Only eighteen. Out of seventy-one! Though, truth be told, I probably won’t frame every single one. I’m pretty preoccupied with the details of getting the stuff up on Etsy, getting ready for the book release party (woohoo! ), and getting ready for a January Gallery Night show at Grava Gallery here in Milwaukee. But in the back of my mind, I keep coming back to the shock of finally finishing the book. I’ve been drawing these characters for so long now that they sort of became friends and I’m really going to miss them. When December is passed and the dust starts to settle, it will be time to toy with new ideas and feel out a fresh direction for my work. I’m a bit burned out, but am vaguely leading my ideas in a fantasy/sci-fi direction. I’ve always been a huge fan of those genres and would LOVE to go that route. I did NaNoWriMo in 2010 and most of my 50k words of rambling were of a space opera type story. But it was much more of a novel and didn’t have any visual elements. Which of course will have to be explored. Because I like my stories to have pictures. They are worth a thousand words, I hear. So I suppose that will be where my next adventure takes me. To the places Ingrid Von Aviary dreamed of reaching and beyond! A new set of characters and possibly some time travel and definitely a rag-tag team of space orphans who find themselves marooned somewhere on earth. This is going to take further development. And lots of friends doing silly things in front of a camera. I think I might know some good space orphans. Actually we’ve only begun to kick. Start. At five days into our kickstarter campaign, we are already 30 percent funded! It’s been giving me so many warm and fuzzy feelings seeing not only pledges, but encouragement and support flood in. We have such a great support network, both here and abroad. Thank you! 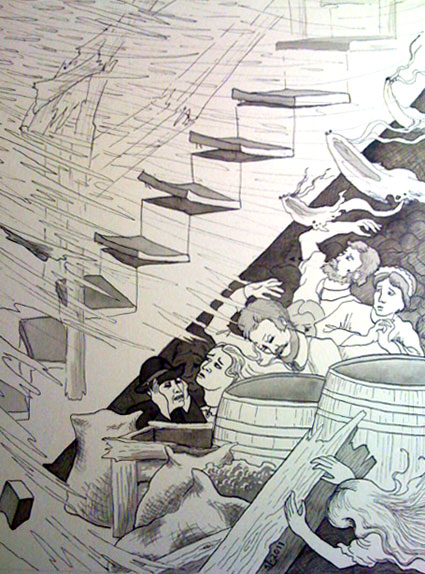 And, of course, if you know of anyone else who might be interested in seeing “The Circus and the Cyclone” become a real, physical, honest-to-goodness book, with pages and everything, then make sure to send them here http://www.kickstarter.com/projects/suelawtonart/the-circus-and-the-cyclone. 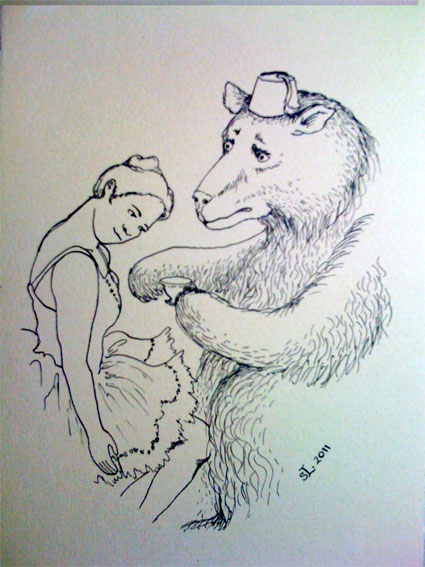 We’ve also added a new gallery for the circus illustrations onto this very website http://www.suelawtonart.com/circus/. Exciting, no?! I spent yesterday evening preparing stripy tent backgrounds to add that extra circus ambience. Also in the works is a possible live circus (of sorts) descending on Milwaukee. This book started with my friends in costumes, so perhaps it is appropriate to conclude the same way. We’re still working out the details, but I’m always up for costumed antics. Always. It’s happening again… Gallery Night in Milwaukee is this Friday and the Hide House will be buzzing with all kinds of activity. Up on the second floor we’ll have a bunch of artists, a bunch of food and drink, and live music by The Vitrolum Republic! I’m also using this as the kick-off event for my Kickstarter campaign to publish the book, so it will be extra exciting. It’s been interesting doing these open studio events this year. It’s something new for my studio partner and I (Jason Krukowski) and welcoming the public into a private creative space still seems a little weird, but also fun. I try to clean up our pack rat museum and make it look presentable, while still keeping it functional and comfortable to create in. In many ways though, it’s futile to “clean” our room, which is full of years worth of thrift store finds, dumpster dives, and rummage sale beauties. Not to mention the slightly embarrassing yet endearing student artworks I can’t just toss or hide away. Also, there’s Jason’s toy collection, my jewelry boxes and doll furniture, and more clocks than anyone actually needs that are all showing different times… kind of like Doc Brown’s art laboratory. I’m working on some adjustments to the Gaius Baltar shrine (aka Baltar Altar) so please excuse its current state. In creating a set for my kickstarter video, we just pulled interesting and fancy looking items from the room and arranged them in the hall: instant circus ambience! Stay tuned for more details as the Kickstarter campaign begins! And if you’re in the Milwaukee area on Friday night, make sure to stop in at the Hide House in Bay View for a spectacular evening of art, music, and revelry. 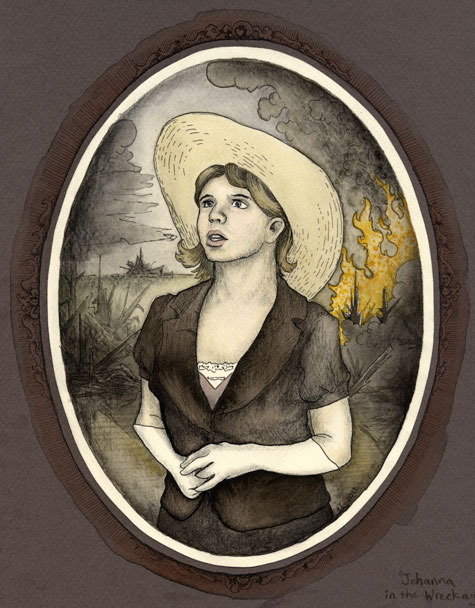 Today, after much folly, I finally finished the cover image for the book. As you can see, it’s pretty complex with a lot of fun stuff going on. And a lot of fun stuff sometimes means more opportunity to mess something up. Which happened. So I started over from scratch and did it right the second time… which was utterly time consuming but totally worth it in the end. The band members serve as the narrators of the story and I thought it would be really cool to feature them as the cover image. Their look and sound really capture what the story is after, even though they don’t have any songs specifically related to circuses, tornadoes, or moon landings. It’s hard to describe how, but certain types of music seem to go well with particular images while others obviously don’t. Some of my favorite bands work with specific visual artists to create their album art and posters in a way that truly compliments their sound and helps to identify what they are about. Some of my favorite examples are Radiohead, The Decemberists, Joanna Newsom, Fleet Foxes, and Sigor Ros‘ Takk album. The visuals are gorgeous and identify perfectly with the sound. I’ve always, ALWAYS wanted to work with musicians in that way. But some of my past band art experiences have been, shall we say, not the best match. However, a few years ago, my husband joined a band that became The Vitrolum Republic. And it turned out to be a great match for both of us. It’s been a rewarding experience to pair my ascetic with their sound and watch everything come together. There’s been some casual talk of doing an animated music video together at some point, so that will be a story all its own! But alas, dear reader, I get ahead of myself. For the task at hand is planning our kickstarter campaign for the book.Yikes! It’s exciting and terrifying at the same time. My circus tornado yarn as an actual, physical book?! Hopefully we’ll be launching by the end of next month. Stay tuned. Every week gets me a little closer to finishing the book. I’m excited and a little sad. I think I could keep doing these illustrations forever. Last week we did a photo shoot for a freak poster. The “World’s Only Pair of Conjoined Fraternal Twins!” features two good artist friends, Heather Chapa and Lauren Grudzinski in a role that is not that far from the truth. Then tonight will be another photo shoot with The Vitrolum Republic as the circus musicians who narrate the story. It should be a fun time, as I anticipate many unique hats, things covered in sparkles and feathers, and above all, the music! As “Water for Elephants” is now in theaters, I’ve just begun reading the book. Between the circus buzz of the movie and the wake of several destructive tornadoes, the timing for this work seems suddenly more relevant. I’ve been struggling this week with the absurdity of my story in relation to the tragedy of the real event, especially as stories from the recent tornadoes come out. 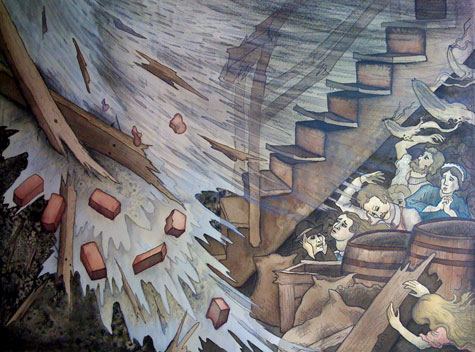 For all of our technological achievements, we are still vulnerable to the whims of nature. A column of air that can throw trucks and rip trees out of the ground is horrifying no matter what time period you live in. A lot of my writing tends to pair absurdity with tragedy, though, now that I think about it. For some reason they need to go hand-in-hand. There is nothing more absurd than the reality of our existence and nothing more nonsensical than mortality. It’s part of why I was attracted to this historical anecdote in the first place. Circus + Tornado = Absurdity + Tragedy. After all the craziness of two shows in one month, it’s time to get back to drawing some characters! I’m working on a series of small, oval shaped pictures of Lenora and her bear friend Mr. Pibbles. 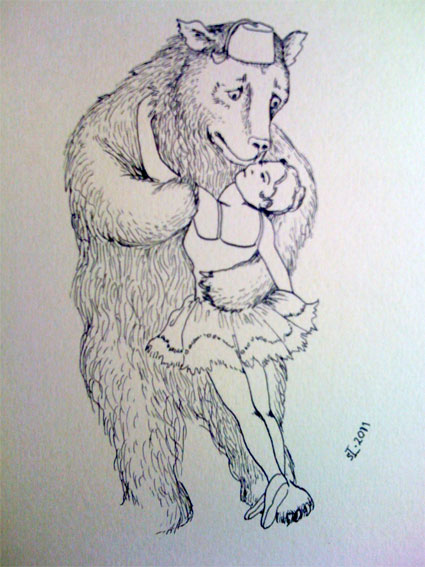 The idea behind these is to make the bear seem more human, more alive, than the girl. 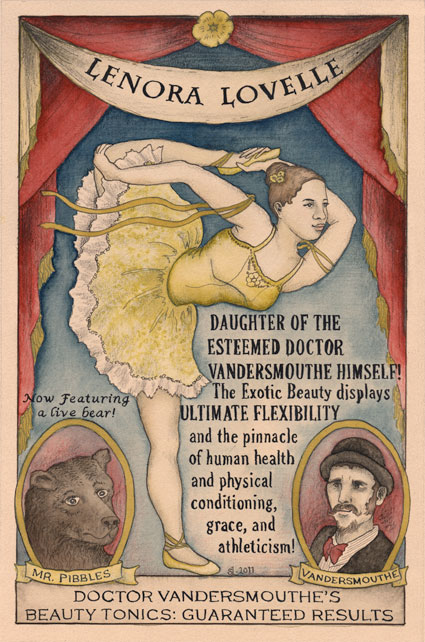 The bear is as fooled as the clowns into thinking the beautiful contortionist is a living, breathing woman. I’m trying to make her look like a doll next to the giant, shaggy bear. Oh yeah, and the bear wears a fez now. Fezzes are cool! My esteemed studio associate, Jason Krukowski and I have been working to put together a little group show for Milwaukee’s gallery night this weekend. I’ve been framing up more circus pictures and Jason’s been painting saucy dames and dapper gents! There will also be several other artists showing and selling work as well: Brittney Biggs, Jackie Steffen-Bublitz, Brent Bublitz, Christopher MacDonald, Lauren Grudzinski, and Heather Chapa. Also featuring live music (Friday night) by the Vitrolum Republic! We’ll be working hard all week to get the show hung and lights set up and ooooh it’s going to be extraordinary!!! I’m hoping to get the band to bring the giant willow tree backdrop I painted for their photo shoot. Spectacular! RANDOM!